The Arkansas football program has now reached a new low. Their interim head coach, John L. Smith, referred to his own team as Alabama. Wishful thinking or honest gaffe? Well, afterwards Smith didn't have a clue he had even mentioned Alabama. Now that's a scary one. With all the reality shows dominating our week-night television experience, I'll bet a reality show on this season of Razorback football would be the highest rated show on the airways. This downward spiral that is the norm for Arkansas these days just never seems to end. 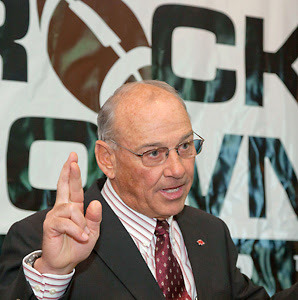 However, Smith told the Little Rock Touchdown Club that he still believes his team can make it to a bowl game. The 'Hogs must win five of their remaining games to become eligible.